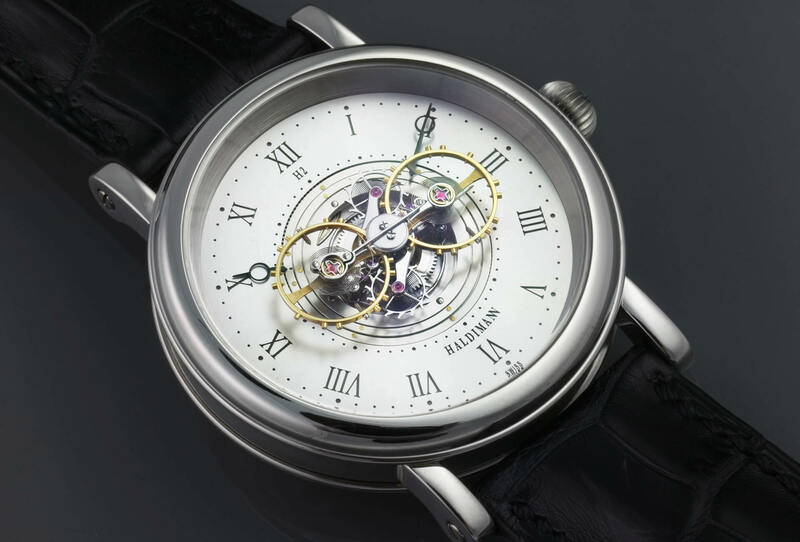 Fascinating watches featuring more than one regulating organ... but what's the reason? 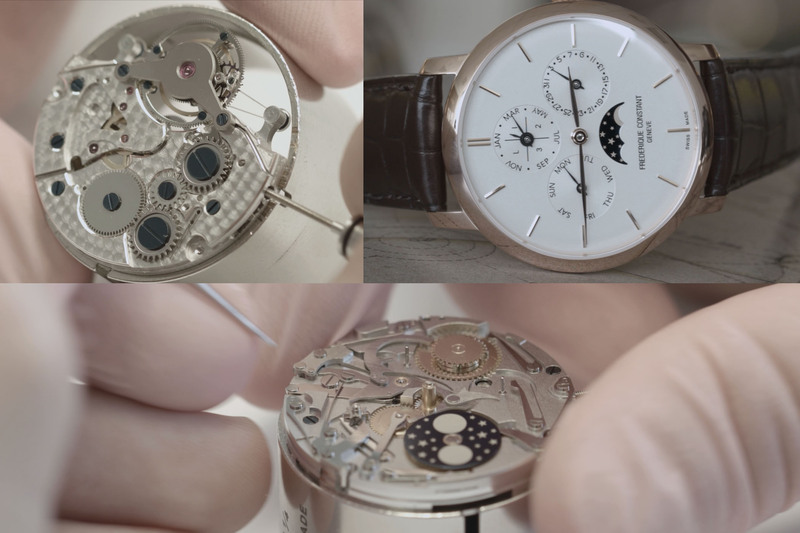 The presence of one single heart is ingrained in our idea of biology and extended conceptually to watchmaking. In order to live – or to indicate the time accurately – one only needs a single beating heart. But there are a few creatures with multiple hearts. 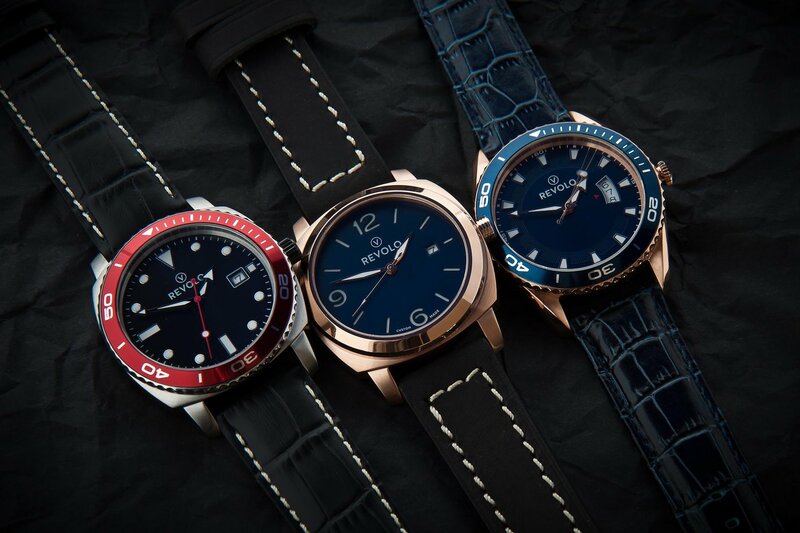 And more and more watches come with multiple regulators – for different reasons. 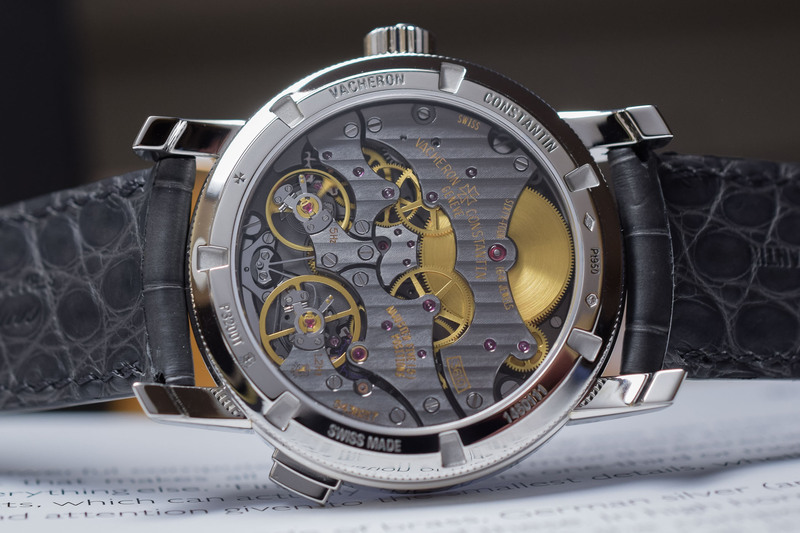 It is time to understand what multiple regulating organs can add to a watch. The regulating organ of a watch is often considered as its heart. The energy stored in the barrel is released in discreet bursts by the regulator that defines the speed at which the watch runs. The regulator comprises the escapement and the balance wheel, two elements working in conjunction. The escapement gives impulses to the balance. In return, the escapement is regulated by the balance wheel. 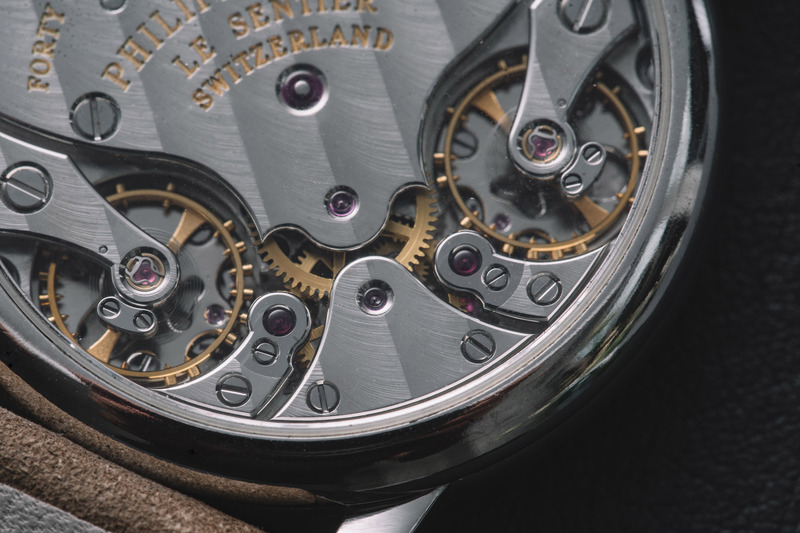 The vast majority of mechanical watches operate according to the same principle. One energy source, one gear-train and one regulator. Some watches, however, use multiple regulators for different reasons. Let’s have a look at a few examples. Several watchmakers have fitted watches with two or more regulators to enhance their precision. A first solution consists in using two oscillators and differential gears to average out their rate. Thanks to this sophisticated gearing, the balance wheels compensate for each other’s errors. Therefore, the time displayed is an average of their rate. 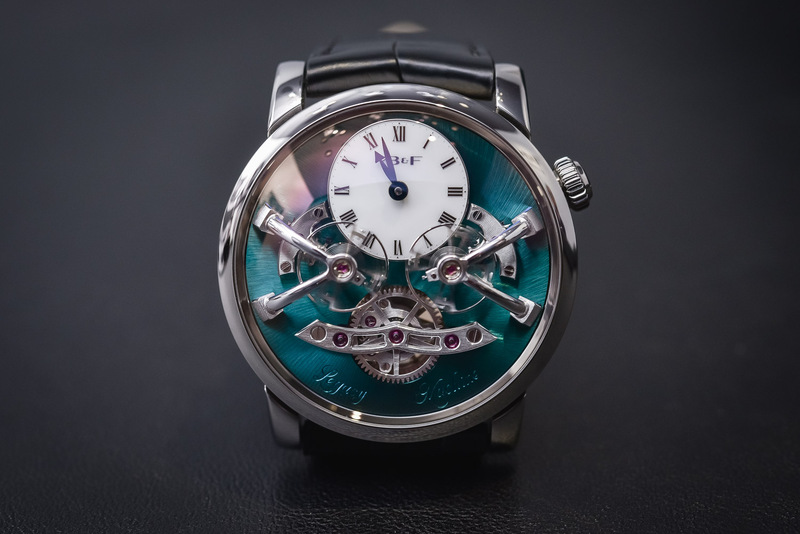 Above: The Philippe Dufour Duality (left) and the MB&F Legacy Machine 2 (right) – both watches feature two regulators with differential gears to enhance precision by averaging the rate of their two balances. Inspired by a double balance wheel pocket watch, the Philippe Dufour Duality (1996) is an iconic example of this concept. Since then, more and more watches use differentials. The Roger Dubuis Excalibur Quatuor Carbon and its four visible regulators, each compensating the errors of the others. Some watchmakers have even built movements with more than two oscillators. 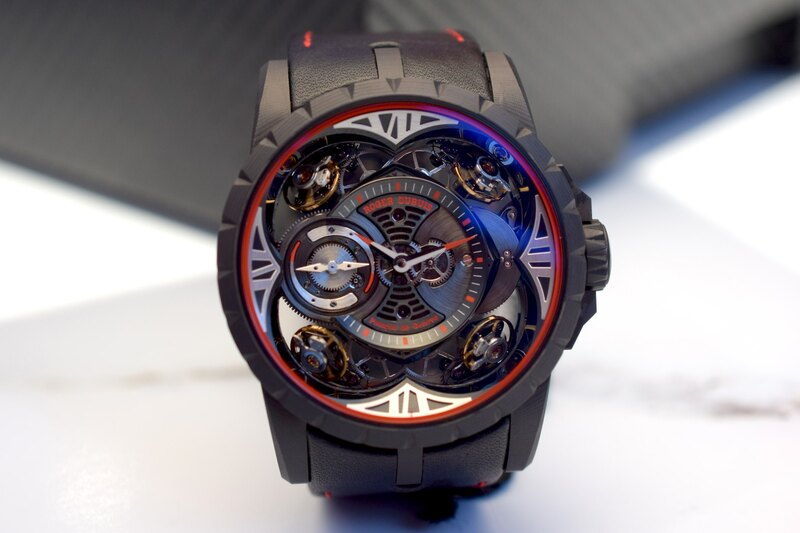 For instance, the Roger Dubuis Quatuor features four balance-wheels linked by a set of differential gears. On paper, the more balance wheels the more precise will be the indication of the time, as the average time displayed results from a calculation based on four indications, reducing the overall margin of error. In addition to that, the four balances are placed in different positions, averaging the effect of gravity. Just as with differential gears, the aim here is to take advantage of two oscillators to enhance precision. In this case, however, there is no differential gear; precision is improved by relying on the well-known phenomenon of resonance. The Haldimann H2 Flying Resonance, with central twin-regulators, relies on the effect of resonance. Resonance is the theory that two oscillating bodies in close proximity influence each other and eventually synchronize. In 1665, Christiaan Huygens was the first to report the phenomenon as two of his recently invented pendulum clocks were oscillating in sympathy. 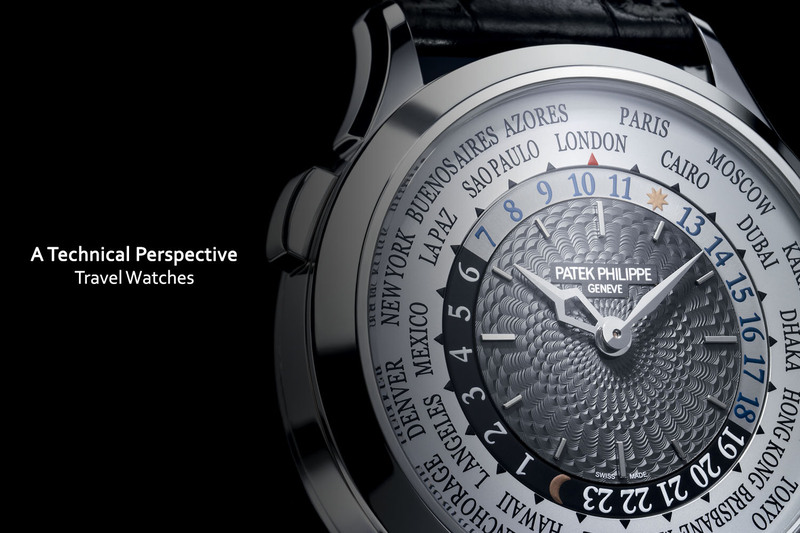 Since then, only a handful of watchmakers have succeeded in applying resonance to their watches. Two centuries ago, Astide Janvier and Abraham-Louis Breguet created “Pendules Sympathiques”. 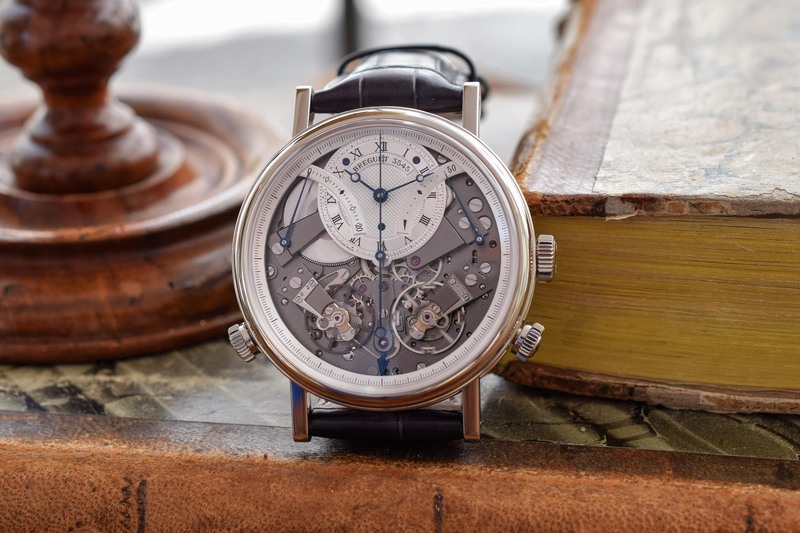 More recently, François-Paul Journe, Beat Haldimann or Antoine Preziuso have sought to take advantage of the synchronicity of oscillators in wristwatches to achieve greater stability and therefore greater precision. 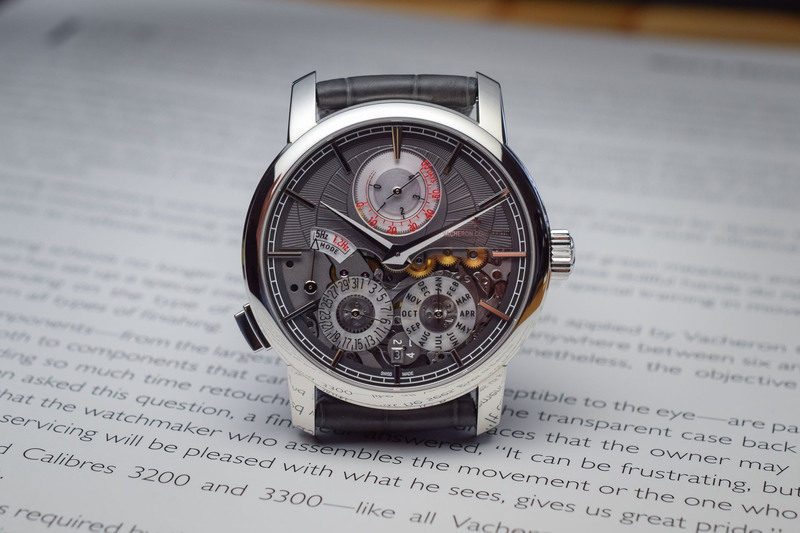 The Armin Strom Mirrored Force Resonance, the first application of the resonance concept by the brand, with dual-balance and resonance clutch spring. 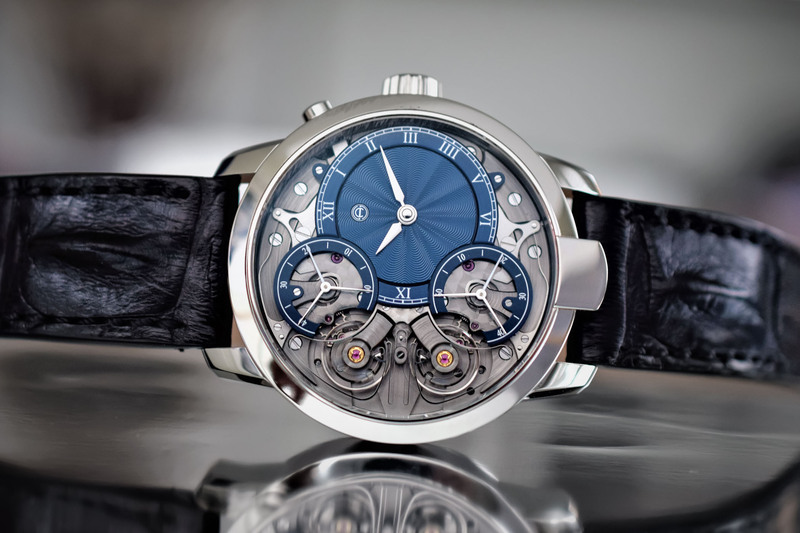 In 2016, Armin Strom presented one of the most interesting applications of resonance with its Mirrored Force Resonance: the dual movement found in this watch features two barrels, two gear trains and two regulators. The two balance wheels are connected by a steel spring attached to their stud and get coupled thanks to the tiny vibrations transmitted by this spring. Another reason to use two regulators is to power different functions and several watchmakers have designed chronographs with dual regulators. For instance, the Breguet Tradition Chronographe Indépendant ref. 7077 features an original dual architecture. Most chronographs are based on a timekeeping ‘motor’ on which a second gear train engages to drive the chronograph. When the chronograph is engaged, there is a loss of amplitude of the balance wheel (friction accumulates with more gears to be driven). The chronograph mechanism of the Breguet La Tradition is independent and autonomous. In fact, there are two independent “sub-movements” – each composed of one energy source, one gear train and one oscillator. 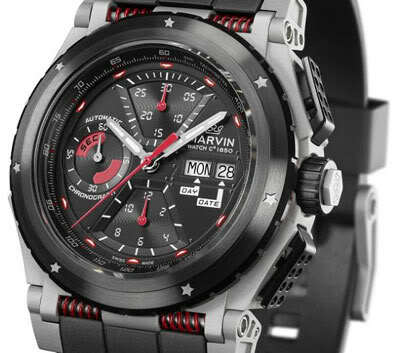 There is no interaction between the timekeeping indication and the chronograph. As a consequence, there is no interference in energy consumption and the rate of the timekeeping movement remains unaffected when the chronograph is started. 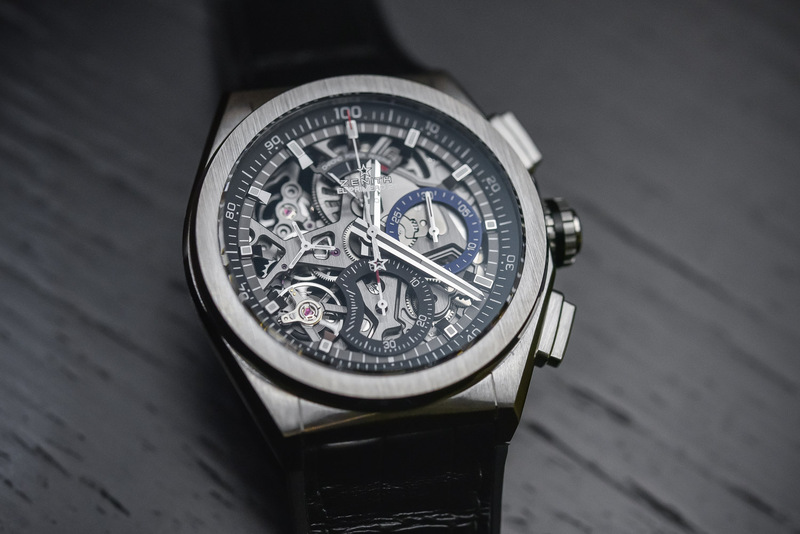 Similarly, the Zenith Defy El Primero 21 features two sub-movements featuring two regulators. The first one, devoted to timekeeping, operates at a 5Hz frequency. The second regulator, devoted to the chronograph, beats at a frequency of 50Hz. The latter allows the chronograph to display hundredths of a second. But with this impressive frequency, the function can only run for about 50 minutes. This is why the time indication cannot be regulated by the same oscillator as the chronograph. A perpetual calendar keeps track of the date with no adjustment needed… as long as your watch keeps running. Which is not the case if you put your watch in storage for some time, specifically in a safe where it might be hard to fit a winder. 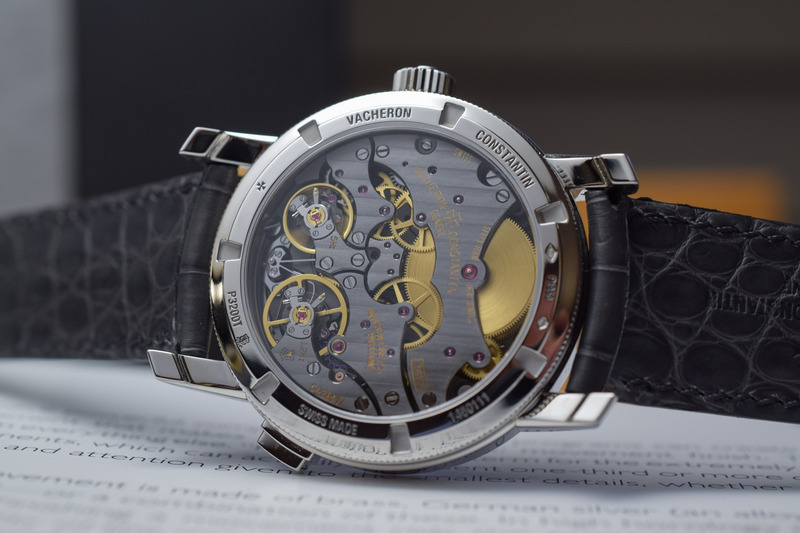 At the SIHH 2019, Vacheron Constantin introduced an ingenious solution to this problem with the Twin Beat, a perpetual calendar incorporating two gear trains and two regulators. When worn, it beats at a high-frequency of 5Hz, perfect for a modern active lifestyle. When not worn, a pusher switches the mode from active to standby (and vice-versa). In standby mode, the watch relies on a second regulator beating at a low frequency of 1.2Hz. This slower frequency will keep the watch running during an impressive period of 65 days. Fascinating, and some lovely pieces as examples. I never knew the Zenith had such a comically short reserve available for the chronograph.